Greece’s official name is the Hellenic Republic, but it is also known as Hellas. The Greek motto is: “Freedom or Death”. On the Greek flag, blue represents the sea and the sky, while white signifies the purity of the struggle for freedom, assisted by the traditional Greek Orthodox cross. The symbol of the city is the owl of Athena or the owl of Minerva. Throughout the Western world, the owl was considered a symbol of wisdom, perspicacity, and erudition. 7% of all the marble produced in the world comes from Greece. The country is one of the main European producers of cotton, pistachios, rice, olives, almonds, tomatoes, watermelons, figs and tobacco and it is also the leading producer of sea sponges. Greece has about 9,000 miles of coastline and more than 2,000 islands, of which approximately 170 are populated. Greece’s largest island is Crete (3,189 sq. miles). Nearly 80% of Greece is mountainous; The highest mountain in Greece is Mount Olympus, it has over 50 peaks with the highest reaching 2917 meters (9,570 feet). Greece controls 23.2% of the world's total merchant fleet, making it the largest in the world (Wikipedia). Feta, which is made from goat’s milk, is Greece’s national cheese. Greece has one of the richest varieties of wildlife in Europe, including 116 species of mammals, 18 of amphibians, 59 of reptiles, 240 of bird, and 107 species of fish. Roughly 100,000 birds from northern Europe and Asia spend their winters in Greece due to the warm climate. Acropolis comes from the word “Acro” (“high”) and “polis” (“city”) and it refers to the sacred hill where ancient Greeks raised many temples worshiping their gods. The most important is the Parthenon honoring goddess Athena. Acropolis withstood all sorts of natural disasters, wars, and invasions for over 20 centuries. Alexander the Great was the first Greek ruler to put his own face on Greek coins. Formerly, Greek coins were engraved with the face of a deity. Ancient Greeks believed the world was ruled from the Mount Olympus by many different gods, each one of them possessing unique powers. Olives over water? According to Greek mythology, the olive tree (given by Athena) was considered more valuable than the water offered by Poseidon, consequently, the city was named after her and she became the Protector of Athens. Today, Greece is the world’s third largest producer of olives. The first Olympic Games were held in Athens in 776 BC and the winner was praised with olive wreaths. 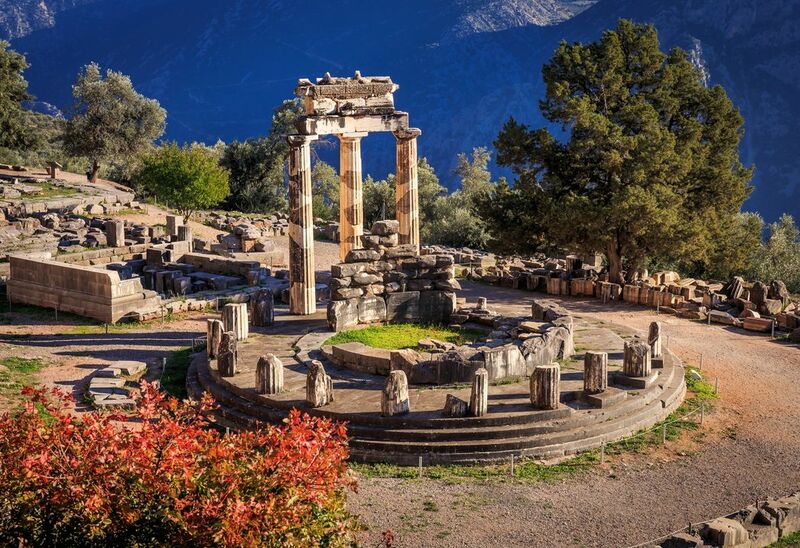 Greek tragedies and the foundation of modern theater appeared in Greece as a tribute to, the god of wine- Dionysus. Plato, one of the most prolific Grecian teachers, is the father of the institute of higher learning in the Western world. Approximately 98% of the people in Greece are ethnic Greeks and 90% of the population is Greek Orthodox. Other minorities are Turks, Albanians, Macedonians, Bulgarians, Armenians, and gypsies. Greek people always bury their dead because the Greek Orthodox Church prohibits cremation. Greek has been spoken for more than 3,000 years, being one of the oldest languages in Europe. Mathematicians such as Pythagoras, Euclid, Archimedes, and Apollonius set the foundation of modern mathematics. 100 bulls were sacrificed during the Olympics as a tribute to Zeus. Among the EU Member States, Greece has one of the lowest divorce rates and one of the highest marriage rates (as per the Eurostat statistics). Greek employees get at least one-month worth of paid annual leave every year.